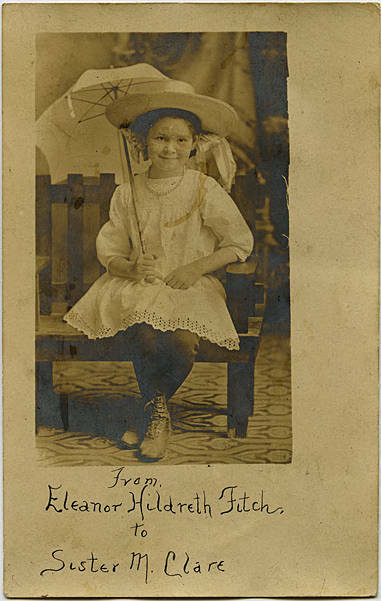 Sepia-toned portrait of a young girl sitting on a bench with a parasol. She wears a broad-brimmed hat and a light-colored dress with lace trim. Eleanor Fitch was about five years old in this picture. Carrie Fitch is Eleanor's older sister; she was approximately 21 years of age and still living on the family farm in Dilley when she sent this postcard. Sister Mary Clare grew up in Cornelius, Oregon and entered the convent in 1904, at the age of sixteen. Her name prior to taking her vows was Agnes Morressey. [front][pen] From Eleanor Hildreth Fitch. to Sister M. Clare. 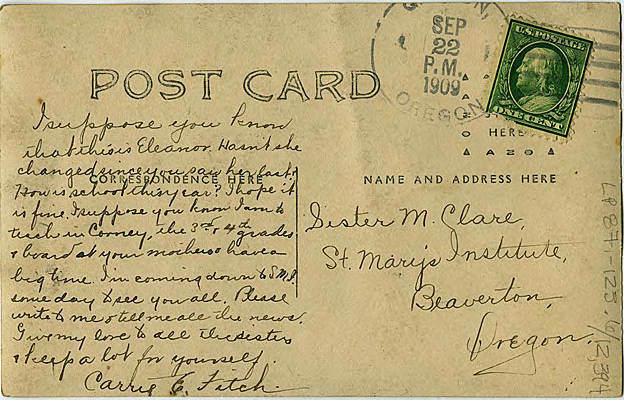 [back] [postmark] [partially illegible] Gaston, Sep 22 P.M. 1909 Oregon. [pen] Sister M. Clare. St. Mary's Institute, Beaverton, Oregon. I suppose you know that this is Eleanor. Hasn't she changed you saw her last? How is school this year? I hope it is fun. I suppose you know I am to teach in Corney, the 3rd & 4th grades & board at your mothers & have a big time. I'm coming down to SMI. some day to see you all. Please write to me & tell me all the news. Give my love to all the sisters & keep a lot for yourself. Carrie E. Fitch.